Morocco, an ancient North African nation preserving a colorful history that spans over 1,000 years, is also one of the world’s most popular tourist destinations, having received approximately 5.1 million visitors in the first half of 2018. The kingdom is famous for its host of magnificent buildings, steeped in a fine blend of Andalusian, Berber-Arab and French influences; and Marrakesh, it’s fourth-largest city, is no exception, from its stunning Menara Airport (which has been dubbed the most beautiful in the world), to its many traditionally-built hotels, museums, and other attractions. 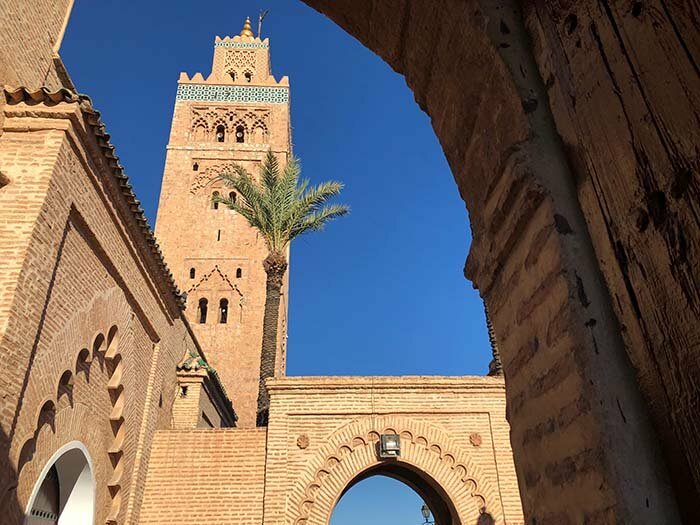 Read on to discover which five breath-taking architectural gems in Marrakesh you simply must visit. Situated within Marrakech’s city center, Djemaa el-Fna is a highly popular spot for tourists wishing to explore the busy atmosphere of the old Moroccan city. As you walk into the square and wonder through the complex, narrow alleys of the city’s ancient Medina, you get the authentic feel of a lively street atmosphere from many centuries past – a feature that’s very characteristic of the old Islamic eras. Here sits the exciting traditional souk (marketplace) where stalls of beautiful craftsmanships of leather goods, perfectly hand-made rugs, Aladdin-style lamps, traditional lanterns and intricately carved souvenirs of all shapes and sizes adorn every corner, while the entrancing scents of Moroccan incense, spices and various culinary delights fill the air as talented street performers and cunning snake charmers entertain the masses. Amidst the crowds however, one landmark stands out the most: the 12th century Koutoubia Mosque, which stands at 253 feet (77 meters). The current mosque was built by the Almohad dynasty, who began work on the old structure (built by the Almoravid dynasty earlier in the century) as they believed the building failed to accurately face Mecca. Its rose-colored shade is very distinctive of all the buildings in Marrakech, and its intricate stonework and grounding arches are very representative of Moorish architecture. While the mosque is completely off-limits to non-Muslims, this won’t prevent you from taking a walk around outside to enjoy the rose gardens and the orange trees, listening to the adhan (call to prayer), admiring and photographing the charming architecture, and rubbing shoulders with wandering kitties. A straight 10-minute walk from Djemaa el-Fna will lead you to the doors of the Ensemble Artisanal Marrakech – a newly-built shopping complex, replete with cozy Andalusian courtyards and a dazzling yet relaxing atmosphere of Islamic architecture. The center shelters a variety of souvenir and traditional craftsman shops which sell handmade leather goods, kitchen and houseware, clothing, perfume, and much more. Everything here is sold at a fixed price, and if you’re not a haggler and the keen souk merchants are a little too much for you, then this place is your perfect alternative: you won’t get hassled, and you certainly can’t get lost. From the outside, the building is eye-catching, with its plain rose-colored stone exterior and relatively subtle Moroccan architectural touches. But walk inside, and you’ll immediately be taken in by the elaborately ornate view that’ll welcome you. To your right, you’ll find a narrow walk-through, like a small courtyard and a few of the craftsman shops scattered around. To your left, you’re met with a wider courtyard, with tables and chairs if you wish to enjoy a snack in the sun, or the local favorite – a refreshing Moroccan mint tea. Within the center of the courtyard, you’ll find that there are a few floors led to by short staircases – each housing several little shops, with the usual displays of goods outside. One spot that caught my eye the most, was an isle inside one of the entrances, where several smiling women were sat skilfully and brilliantly hand-weaving traditional Berber rugs. Built by the Grand Vizier Si Moussa during the late 19th century, Palais de la Bahia (literally translating to ‘Palace of the Brilliant’ or 'Palace of the Beautiful') is a splendid palace and set of gardens which, at its time, was intentionally designed to be the greatest palace. Decked in traditional Berber-Arabesque ornaments and designs, the stunning historical structure reportedly features 150 rooms, replete with a harem, situated alongside the tranquil Court of Honor. Today, it welcomes the public daily and sometimes hosts special events, such as the Marrakech Biennale, which is a major Trilingual Arts festival and the first of its kind in the region. The background history behind this splendid construction is rather intriguing: The Grand Vizier Si Moussa, who first built the palace for his personal use, was actually a former slave who rose to power through rather unlikely means. The palace was then passed on to his son Bou Ahmed, who played a significant role in giving the palace much of the splendor it’s known for today. 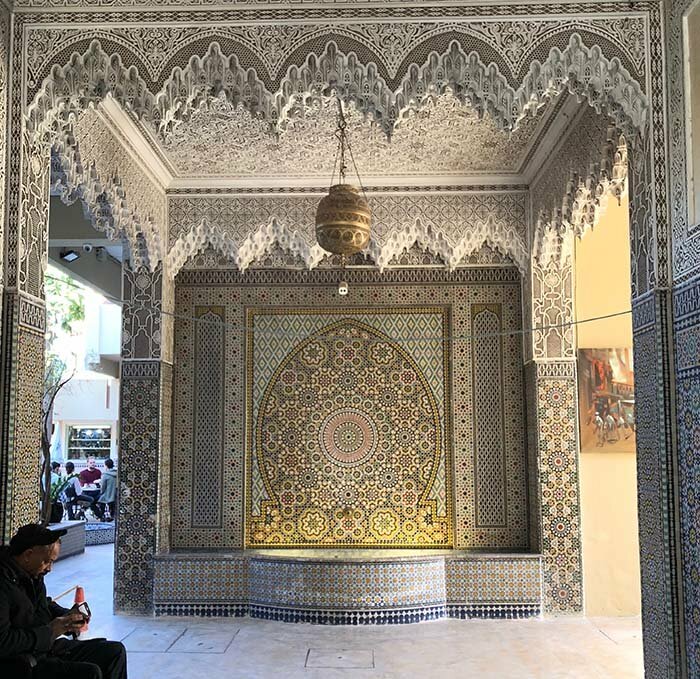 Magnificent gardens decorated with the country’s trademark citrus trees were added, rooms were further decorated in striking Andalusian style, and a small surrounding riad, which visitors pass by as soon as they enter the palace, was also added. 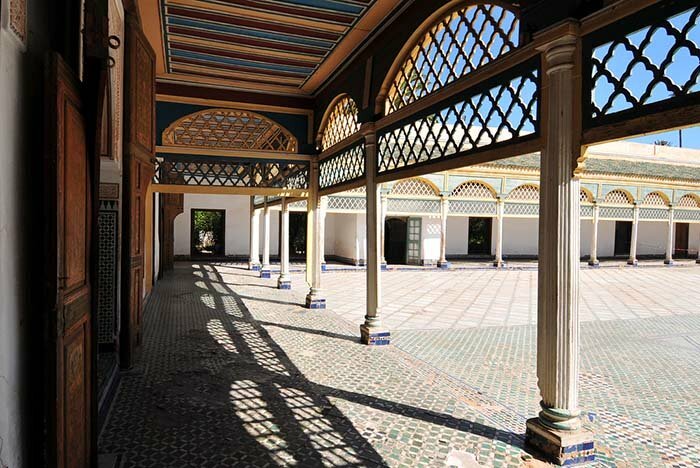 As was the norm in most imperial abodes from these parts of the world, the Bahia Palace housed several concubines alongside the royal residents, particularly during the reign of Bou Ahmed. Unfortunately, the harem is off-limits to visitors, though you’re still able to explore the very personal living quarters – more notably that of one of his wives’ Lalla Zineb; here, you’ll see what’s left of her apartment’s stunning interior, including beautifully colored stained-glass windows and carved furniture of rich, dark wood. 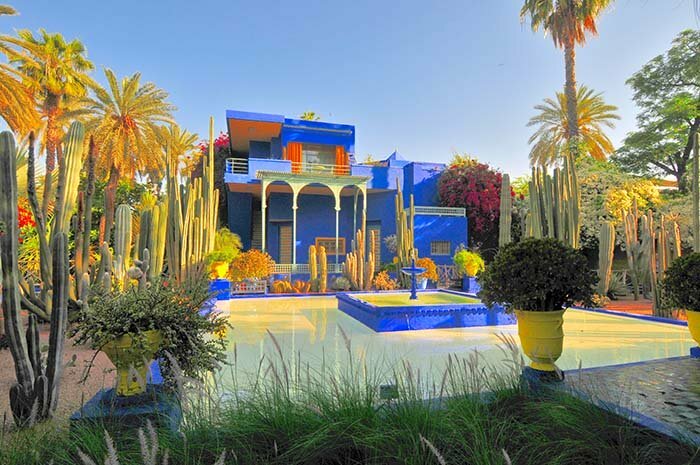 Created by French Orientalist artist, Jacques Majorelle in the 1920s, this picturesque botanical garden is certainly a work of art and fine architectural beauty. It features a collection of cactus plants, coconut palm trees, vibrant flowers, banana trees and woods of bamboo, surrounded by marble pools, water fountains, and elevated footpaths. As soon as you walk in, you’ll sense an air of almost utopian artistic quality, one that is especially unique to Orientalist painters. Every glance at Majorelle’s choice of striking colors speaks volumes, and you’ll feel like you’ve been swept into a real-life painting. One of the garden’s most striking features, however, is its architectural centerpiece – a small abstract villa of an arrestingly beautiful shade of peacock blue, designed by the French architect, Paul Sinoir, later in the 1930s. Throughout the years from the time it was built, the garden sadly fell into neglect. Fortunately, however, it was rediscovered by the famous French fashion designer, Yves Saint Laurent, who, along with his partner Pierre Berge, proudly restored it to its former glory. Today, the Majorelle Garden is open to visitors for an entrance fee of 30 Moroccan dirhams (US$3.14). 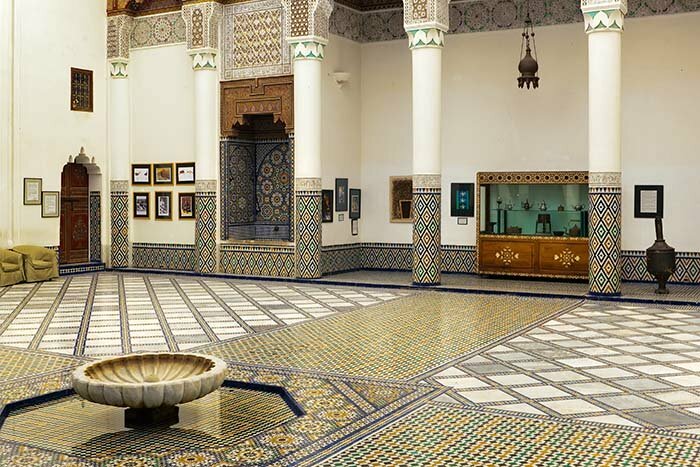 Marrakech is home to several museums, displaying items, clothing and furniture of national heritage and history. One of these is Dar Si Said (literally translating to ‘House of Si Said’), a former palace located in the southern Medina, which boasts an elaborate interior of intricate carvings and tilework, majestic ceilings, an airy courtyard, ornate water fountains, beautiful balconies, and the finest Moroccan craftmanship and handicrafts – all so typical of traditional Andalusian tastes and Islamic architecture. Here, you’ll discover Marrakech’s 19th century aristocratic lifestyle, and you’ll have the freedom to stroll around and even explore the various grand rooms situated within the upper floor of the building, with some display items dating back as far as the 11th century. One of the oldest and most intriguing sights in the museum is the 1,000-year-old stone basin, which sits right at the entrance. Not only is it an item of rare antiquity, but it’s also a masterpiece of Islamic art, first built in the 11th century in Cordoba, Spain, after which it was moved to Morocco, where it stood in the Ben Youssef Madrasa (an old Islamic college) for several centuries. Admission to the Dar Si Said museum costs 10 Moroccan dirhams (US$1.04) for adults, and 5 dirhams for children under the age of 12.